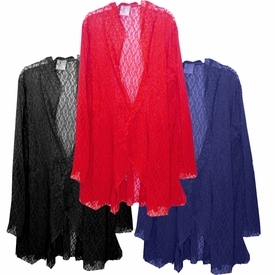 These are stunning lace crochet jackets, in plus sizes 0x to 9x! They run very big, so make sure & check measurements below! They have 3/4" sleeves, and run appx 36"-38" long, but are available in other lengths as a special order. 0x: Chest:52" - Hips (appx):68"
1x: Chest:58" - Hips (appx):72"
2x: Chest:62" - Hips (appx):76"
3x: Chest:66" - Hips (appx):82"
4x: Chest:70" - Hips (appx):86"
5x: Chest:74" - Hips (appx):90"
6x: Chest:78" - Hips (appx):94"
7x: Chest:82" - Hips (appx):98"
8x: Chest:86" - Hips (appx):102"
8x: Chest:90" - Hips (appx):106"